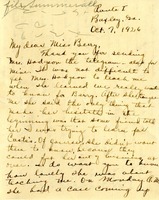 Irene Powell Hodgson wonders if the beaten biscuits she read about Henry Ford having at Berry were made from her recipe. 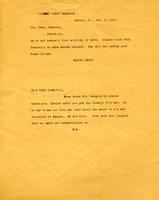 She asks Martha Berry if she can assist with finding a "high class man" to take over her Jersey heard, and whether she might lease a bull from Berry to sire her cows. Telegram asks Mrs Chas. Hodgson to teach Miss Summerall how to make beaten biscuits. Letter to Mrs. Hodgson says that Berry does not commercialize their products.